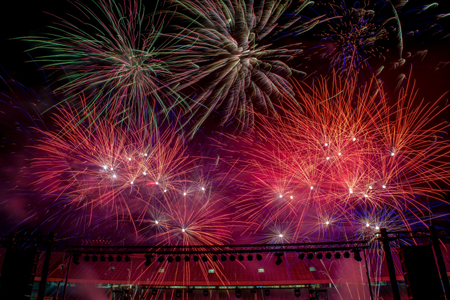 I’m working the Diwalli Fireworks Display with Lone Star Pyrotechnics this Saturday at the Cotton Bowl in Fair Park. We are trying to run a 12 person crew for the event and I have 3 open spots if you want to work an awesome display in an awesome venue. Send me a PM with your cell phone number if your interested. We all show up at the cotton bowl at 9AM Saturday, we enter the cotton bowl through the tunnel on the east side of the stadium. We spend the first hour covering safety and planning how we are going to distribute product and setup the display. At 10AM to Lunch we break into groups and start tackling the different jobs, I’ll work with you and make sure your confident in what your doing. The majority of the work is light manual labor nothing too hard. Once we have modules and product spread out, we start wiring the display to the controllers. Imagine wiring speakers into amp with the push terminals, but we are doing a bunch of these. Luckily, polarity doesn’t matter, making the wiring very easy. At 12PM to 1PM we break for lunch. Not sure if Lone Star is bringing lunch or not, the companies usually provide lunch, but we are downtown and there are quick options around. 6PM we usually break till the display is shot at 10:30PM, during this time you get to walk about the stadium as well as check out the awesome food vendors at the event. There is going to be a live concert going on as well that you will have full access to see in front of behind the stage. It really is a cool production to see. 11PM the Display is lit and we all stand back and enjoy our handy work. Seeing fireworks shot on multiple levels of the stadium is a very cool experience. More so when you built the show. 12AM Show ends and we start cleaning up. Clean up usually takes an hour and we are packing up and leaving by 1:30 or 2. Yeah it is a late night, but I never really feel it as I’m usually riding the high of putting on an awesome display. So, if this sound interesting, please send me a PM with your Cell Phone Number and I’ll try to add you to the crew. It is a really neat opportunity and one of the largest displays I’m a part of each year. Here is a video from the display last year!